NSFW: I can totally see that rabbit’s cooter. Yeah, I think I’m with you on that one, Paul. If they’re balls, then it means the Easter Bunny shaves his scrote, and that’s a dark place I don’t wanna be! 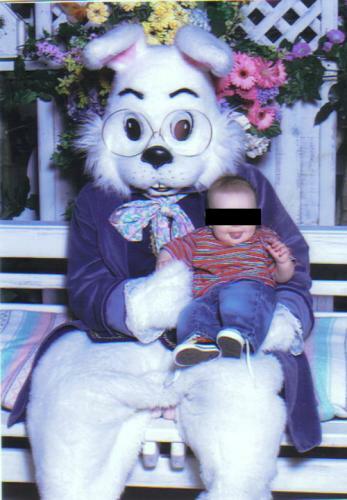 Imagine my shock after I mailed out copies of this and other Easter pics taken at the same time to all my friends and relatives – including my grandparents – and had someone point that out to me a week later. ItÃ¢â‚¬â„¢s the stripped pillow people! Lol that is awesome. Thank you so much for sharing your shame for humor on the interbutts. I salute you.